NORTH BAY, Ont. — The Northern Ontario rivalry between the North Bay Battalion and Sudbury Wolves has been re-energized. 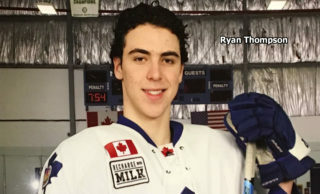 While North Bay has ridden a recent hot stretch to a won-lost-extended record of 21-19-3 for 45 points, third in the Ontario Hockey League’s Central Division, Sudbury is 24-14-3 for 51 points, second in the division. The last season in which both clubs made the playoffs was 2013-14, the Troops’ first in the Gateway of the North. With the Battalion 10-1-1 in its last 12 games and the Wolves winners of their last three, the teams meet at 7:05 p.m. Wednesday at Sudbury. “We’ve played them four times already and we’ve got a little bit of game film from them, so we start to figure out some tendencies that you can learn from some of it,” Battalion assistant coach Adam Dennis said Tuesday. Sudbury is fourth in the Eastern Conference and the Battalion sixth, one point behind the Peterborough Petes. The conference quarterfinals pit the third- and sixth-place teams as well as the fourth- and fifth-placed. Battalion goaltender Christian Propp has a personal 10-game winning streak, having produced a career-high 50 saves in a 7-2 victory Saturday night at Peterborough. Christian Purboo was in net for a 2-1 loss Sunday night to the host Kingston Frontenacs in which winning goaltender Brendan Bonello made 56 saves. “I thought Kingston was a little bit more the way that we want to play,” noted Dennis. “I thought we started out slow and we didn’t really get to the areas that we want to go, but we at least held the puck in their end a little bit more. Dennis, a former goaltender, praised the play of both Propp and Purboo in the Troops’ recent run. Sudbury counters with import Ukko-Pekka Luukkonen, who missed the teams’ two most recent meetings while backstopping Finland to the gold medal in the World Junior Championship at Vancouver and Victoria. The Battalion won both games, 5-3 at Sudbury on Dec. 28 and 5-2 at North Bay on Dec. 31 to even the season series after the Wolves prevailed 4-3 at home Nov. 4 and 7-1 at Memorial Gardens on Nov. 16. Since their last game against the Battalion, the Wolves have made five trades, dealing four players and five OHL Priority Selection picks for two players, in centre Adam Ruzicka and defenceman Anthony DeMeo from the Sarnia Sting and Sault Ste. Marie Greyhounds respectively, and five picks, two of them conditional. 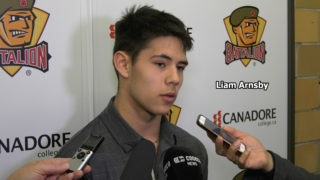 Among those dealt was defenceman Zack Malik, acquired by the Battalion on Jan. 8 for a fifth-round choice in 2021. He figures to face his former teammates for the first time at Sudbury. 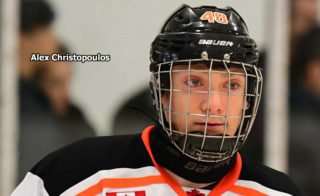 With goaltender Jake McGrath having been sent to the Niagara IceDogs at the trade deadline last Thursday, Luukkonen will be backed up by 16-year-old Jonathan Lemaire. 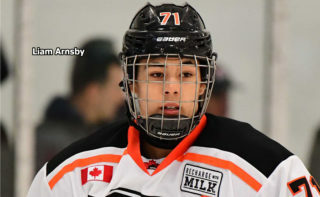 He was a fifth-round pick in 2018 who was playing with the Kemptville 73’s major midgets. The Battalion’s Justin Brazeau, who ended Bonello’s bid for his first OHL shutout at 18:57 of the third period, is tied with fellow right winger Tye Felhaber of the Ottawa 67’s atop the league scoring race. With each having played 43 games, Felhaber has a league-leading 47 goals and 28 assists for 75 points, while Brazeau has 41 goals and 34 assists. 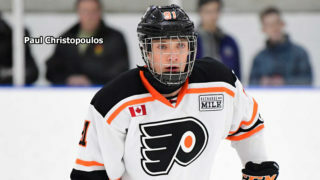 Centre Kevin Hancock is third with 70 points from 34 goals and 36 assists in 42 games but, because of a trade to the London Knights from the Owen Sound Attack, still has 28 games to play rather than the 25 available to both Felhaber and Brazeau. 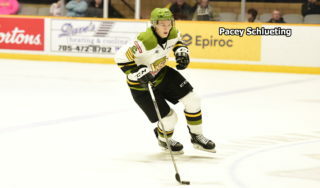 The Battalion completes play this week by playing host to Sault Ste. Marie on Thursday night and London on Sunday.